A recent sesh at Millers saw me bump into Dennis on his new magic carpet. Cos I'd seen Joe ripping on his version a coupla days earlier, I decided to grill Dennis on what these new strange looking boards were all about. Turns out you better grab one if you want to survive the summer! It gobbles anything from ankle high slop to overhead juice. Q: So what’s this new board you’re making that has everyone talking – what’s it called? A: Okay, its’ been called a lot of things, mostly flippen ugly. The Firewire version is called the Sweet Potato, and the Al Merrick version is called the Biscuit. There are a lot of variations around the world. Mine, I have tentatively named The Bompie (or maybe the Stompie!) (ED - had to ask Dennis what a Bompie was - turns out back in the day in the townships the ou's bought wine that was decanted into lil plastic packets and then wrapped in brown paper - and was called a Bompie. I decided not to ask Dennis why he knew that!!) UPDATE: Officially called the Vetkoek. Q: What are its dimensions, give us some technical secrets! 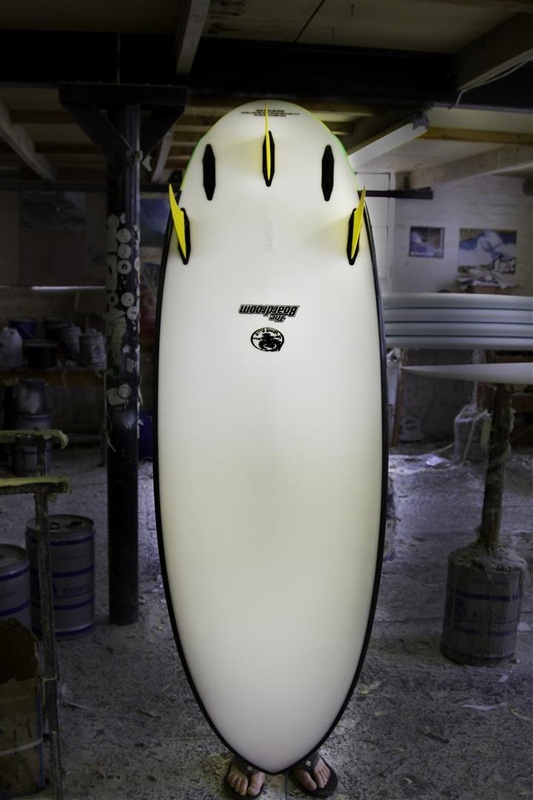 A: My personal board is 5’4’’ x 21.5’’ x 2.5’’. The surprising part is that the tail measurement at 12’’ is almost as wide as the middle, 18.5’’! Q: What inspired you to try making something like this? A: Good question! I definitely didn’t think it would go as well as it does, but then I thought the same about the Tokeloshe model. I thought that was too small at 5’8’’! With surfboards, one needs to keep an open mind though, and when my brother got the Firewire version, I gave it a spin and immediately saw the benefits as a board for P.E., specifically for places like the Pipe, which we all love to hate. Q: What conditions is it designed to work best in? A: It’s really designed for small mushy conditions, but its versatility was an absolute bonus. Q: Have you tried it out in decent conditions yet? How did it handle? A: Yes, I’ve surfed 4-6 ft barrels on it a couple of times, and the performance blew me away. I didn’t expect it to go, but it is one of the easiest boards to surf, the shortness of nose fitting into steep drops so well, and the quads giving it amazing drive. Q: Why do you think there’s this move towards shapers revisiting old style designs? A: It’s important for us not to lose track of our roots, because we can learn so much from the past. 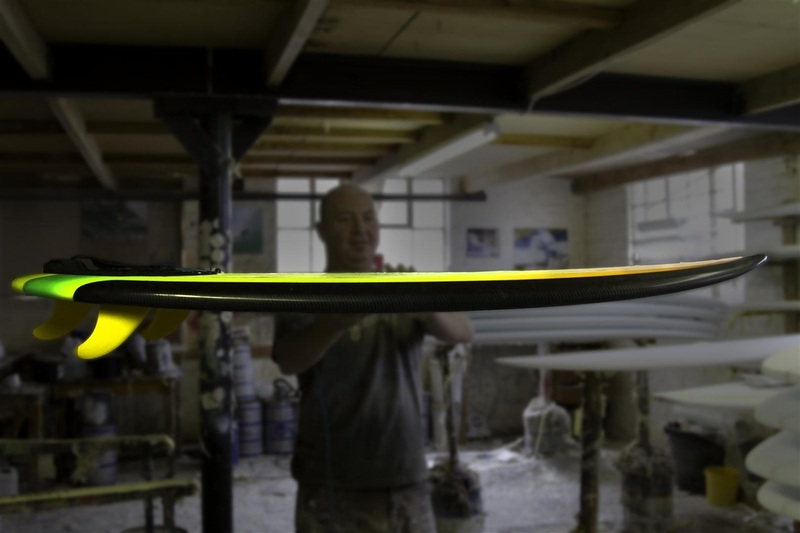 Surfboard design specifically seems to repeat on itself and each time a new design is revisited, it is adapted, enhanced and progresses. Look at the shortboards people are riding now. Some of them you could literally whack a single fin on and fit into a session 30-40 years ago. I think it was Tom Curren who said that when we look for answers in board design, we always end up going back to the Fish. This beast isn’t a Fish, but it subscribes to the theory that less is more. Q: Are you putting modern tweaks on them that make them work better than the originals? A: The only drawback I found with the original was that it had vee in the nose which seemed to act as a bit of a hand-break . I’ve run the concave right through to the nose, true to most high performance shortboards and it’s made a big difference. The other aspect was adding a 5th fin box, just to have a few more options. 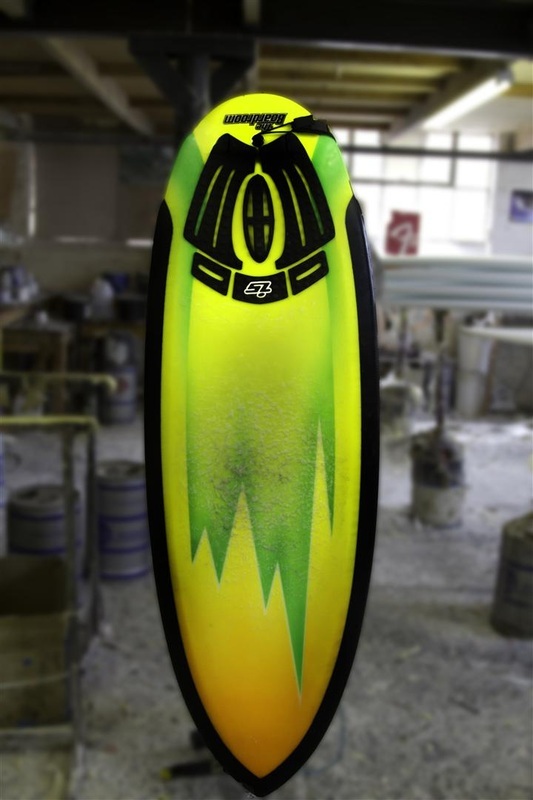 Q: If someone wanted to get a board like this, what sort of size would you suggest versus their “normal” shortboards? A: The formula is to ride them about 8 inches shorter, 3 inches wider and about a quarter inch thicker than your normal board. Or in relation to your body, at about chin height. This is just a rule of thumb though, everyone is different and the beauty about surfing is you can do what you like. Q: Your version is a quad, what’s the deal with quads – are they faster, do they turn better – what advantages do they have over the normal thruster? 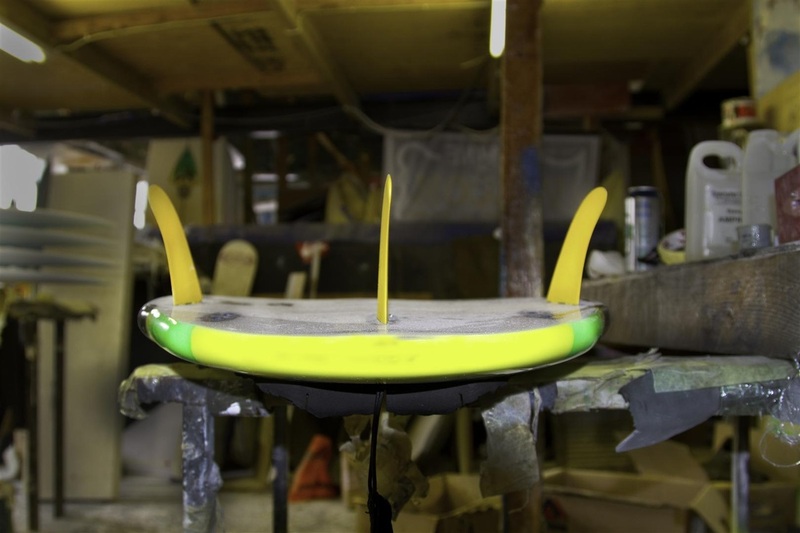 A: This particular quad setup has very specific fin placements, to give the board the maximum amount of drive and hold. There is no sliding or spinning like Deryk Hynd without fins. It’s about drive, which is critical with such a large amount of tail area. The advantage over the thrusters is the extra straight line speed and holding power. You feel it going down the line and in cutbacks, but I still think the thruster has the edge for off the lips. Q: You’re riding one at the moment, who else has ordered one? Are there guys on them at the moment? A: Kelly just called...ha ha. I’ve only done a few, but the guys have been stoked with them and the orders are coming in. You’ll see Pipe master Vaughn Jones hooking his, at the Pipe and Joe ’very fast’ van der Linder on them at this stage, but many more to follow. Q: Anything else to add!? 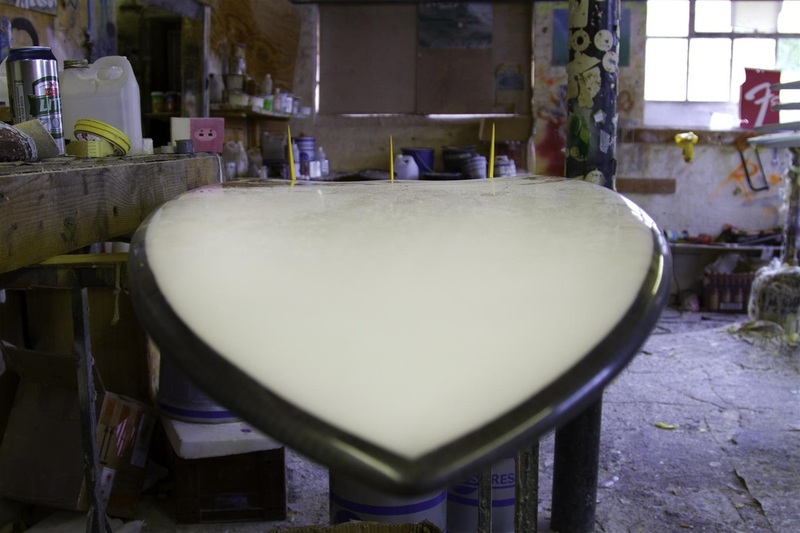 A: Surfboard design is about having an open mind. What held everyone back for years was the ‘’I want to be Kelly’’ mentality. Boards got silly and okes were insistent on riding the same boards as pro’s. We’re not pro’s, we don’t surf the like them, and we shouldn’t surf the same boards. Have an open mind when you order your next board, take some advice from your shaper ,its free and he just wants you to surf as well as possible and have fun. If you want to win 12 world titles...you’ve left it a bit late. Want a Bompie/Stompie? Get hold of Dennis at the Boardroom on 041 - 586 2276. Or pop in and see him at the factory, bottom of Brickmakerskloof in the lil industrial complex. Drive in, and it's up on your right as you go up the small ramp inside. The bell doesn't work lank well, so just yell! !